In a world where the median burger size is about 8 ounces of meat, in a world where a well balanced meal should have about 3 to 4 ounces of meat, just what is this kind of offer – the MONSTER – doing for our belt lines? 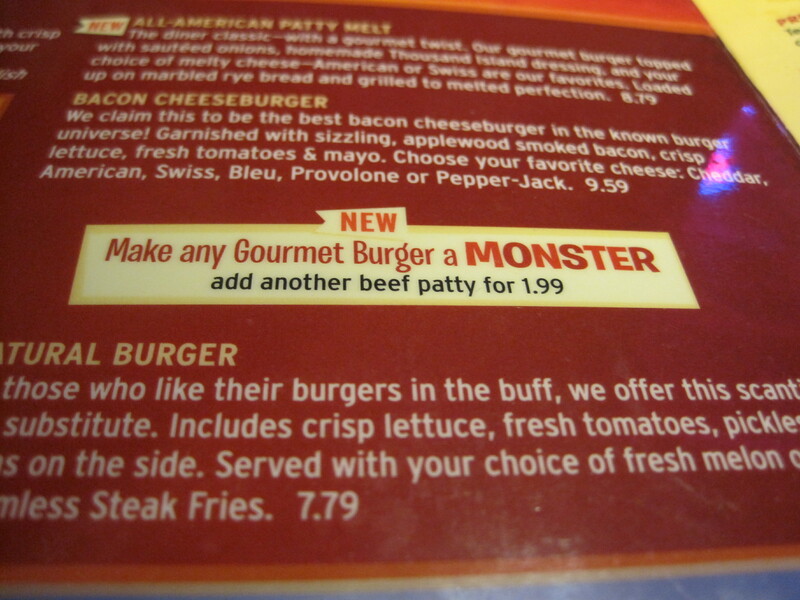 The MONSTER is a one pound burger. What ever happened to the Quarter Pounder, which was pretty big back in the day of its introduction? 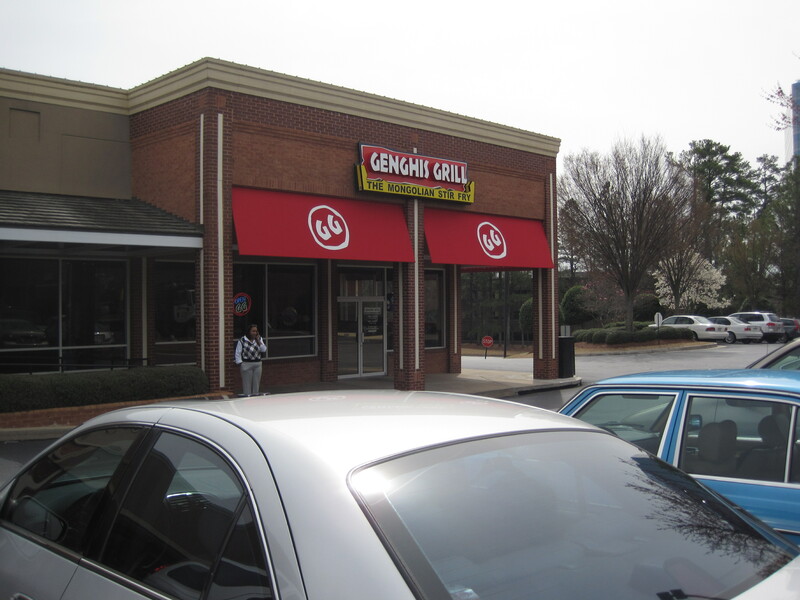 Coworkers talking, and conversations on the Urbanspoon message boards led to my taking a look at Genghis Grill. It’s a newly opened instance of a chain, sitting pretty close to Madeleine’s near the Perimeter. That puts it very near work and people from work have been going there for a while. Inside, I find it a little cramped and a little loud. You’re not exactly resting elbows with other patrons, but it’s close enough nothing you say will be private. The signs that pepper the place are a little “in your face” and the signage has the attitude of someone who thinks he’s funny. Otherwise, though they really don’t have the space, they’re trying to be a little sports bar-ish. Televisions and a small bar can be found in here. Overall, however, though there are unpleasant edges to the seating, it’s not unbearable. I think Flip Burger Boutique is too cramped for its own good as well. The routine here is: you’re handed a smallish steel bowl and you select meats, spices, vegetables, a sauce, and when you hand your bowl to the cooks, a starch. They trade your bowl for a number, which you place on a stand. Then you wait. After a bit, your food comes to you, hot and piping. 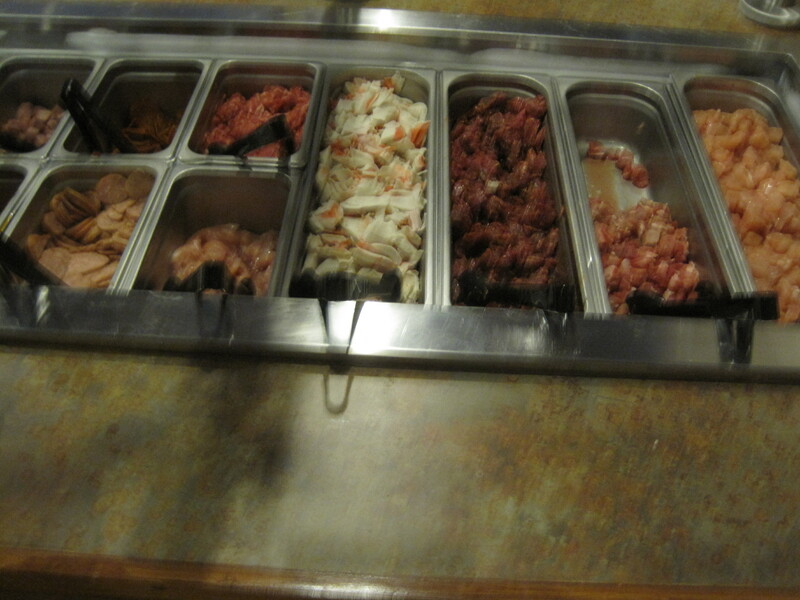 And though they call it a Mongolian stir-fry, I know this kind of eating as a Mongolian BBQ. The business end of this chain are the cooks who sit around a donut shaped grill and mass process orders. I found my brief conversations with them quite enjoyable. If the place wasn’t as crowded, that would be the place to be here, watching them cook. I liked what I ate. I went back for seconds. At lunch, the basic one bowl is about 9 dollars and unlimited bowls are 2 dollars more. For me, needing plenty of vegetables, the second bowl is a bargain. Bowls would seem larger if I had added a starch. 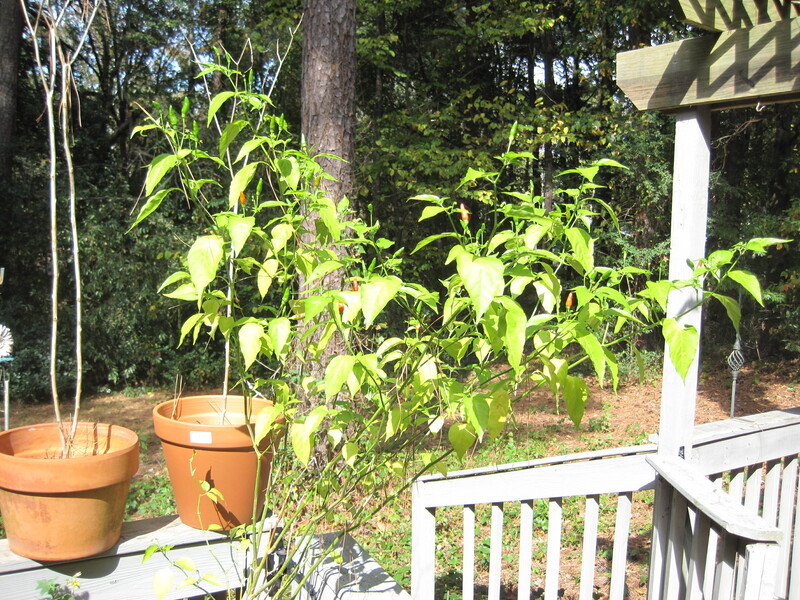 If you can control what you eat, this is a good place for dieters. It would be better for diabetics if the sauces wouldn’t be so sweet, but they have enough dry spices you don’t need the wet ones. 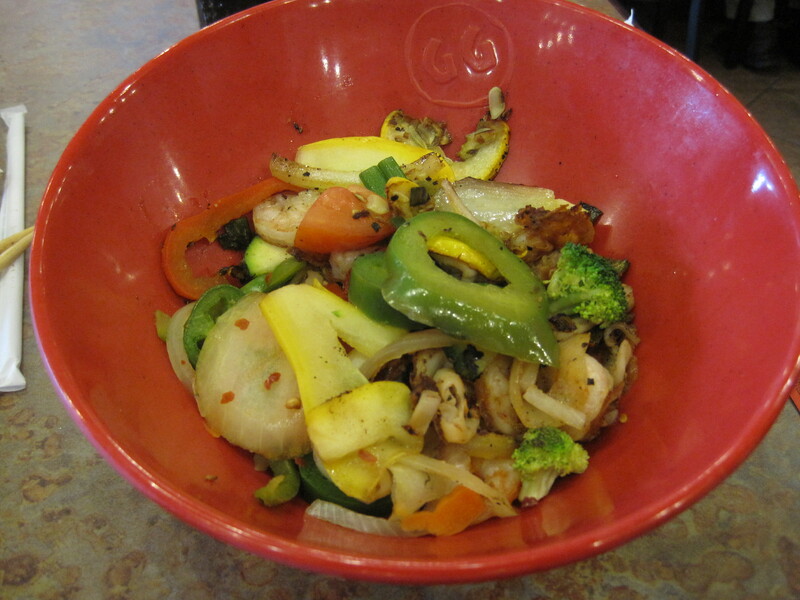 A spicy sesame oil would be something I’d add, if I were the wet sauce maestro of Genghis Grill. Overall? A little rough around the edges, but the core experience isn’t bad. I heard diners comparing this place to “Chow Baby”, saying that this place had more food choices. 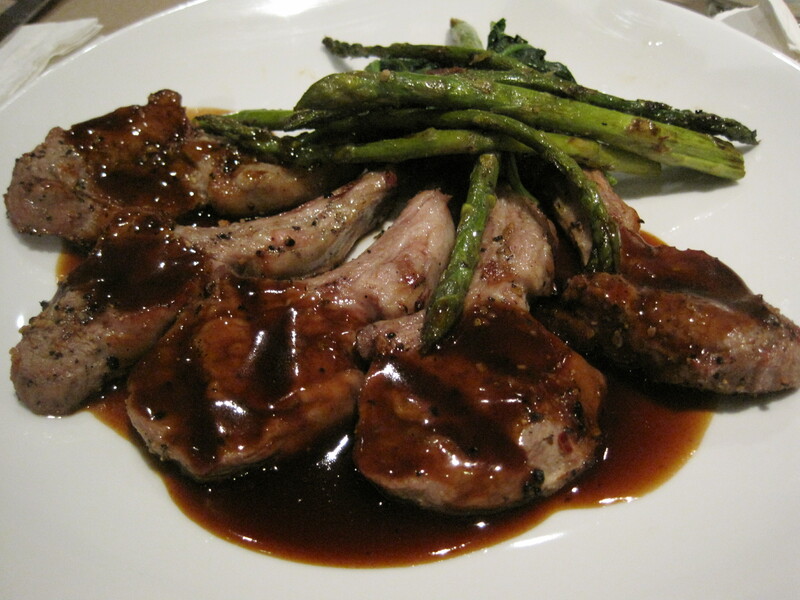 If I recall, there were perhaps a dozen or more meat choices, including seafoods (one bowl of mine was shrimp and calamari based, the other more chicken, beef, pork), two stations of vegetables with perhaps 20-30 vegetable choices, and over a dozen invariably sweet sauces. There were perhaps a dozen dry spice options, most good. 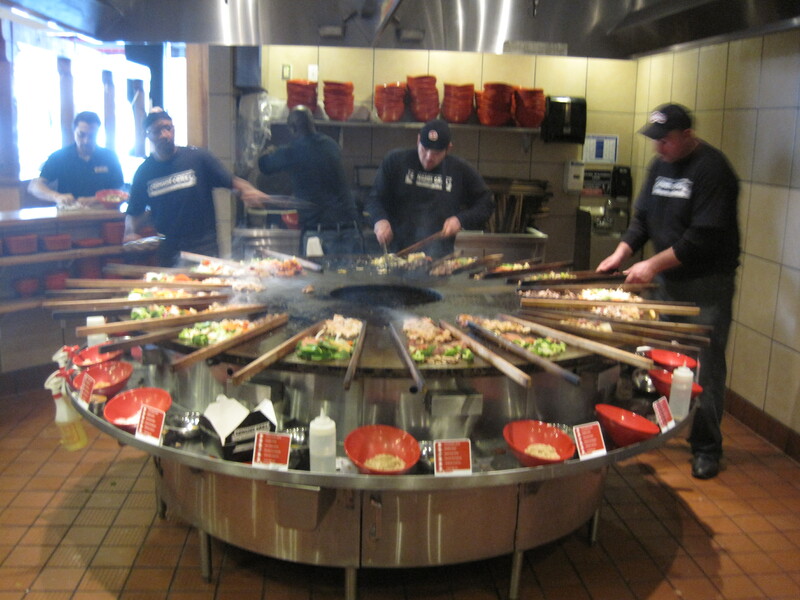 I haven’t seen Mongolian BBQ commercialized in this fashion before. 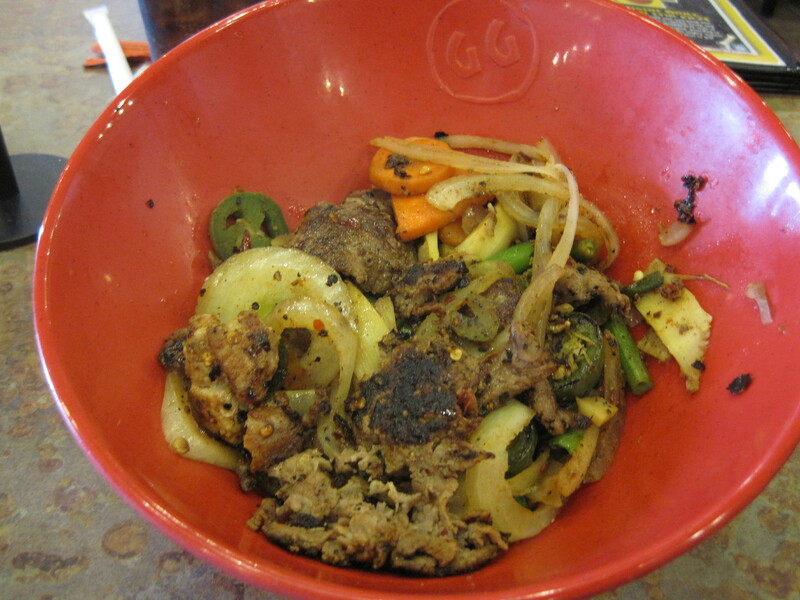 The last place I was getting Mongolian in any fashion was the old Badayori, now long gone. So it’s quite a concept. The action of course, is around that large shared grill, and if watching people cook is your thing, I’d come here during the off hours and hang around the grill while your food is being prepared. 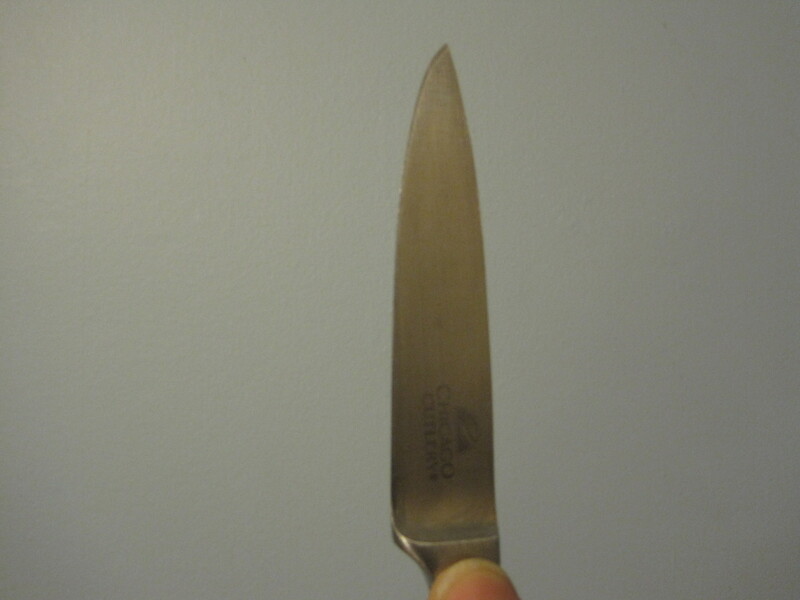 It’s a miracle of modern civilization, called the stainless steel knife. Using one of these, you can cut your food into reasonable portions. You can then doggie bag the rest, to be eaten later or given to those in need. In the process, you get to practice prudence, practicality, and portion control. The 3 P’s, and a good oft used knife, will put you in good stead no matter how healthy or unhealthy your particular dietary routine might be. With all due respect to Mark Bittman and his recent Manifesto, the essential issue in American food and health is portion control. Eating enormous quantities of very healthy food doesn’t make you any healthier than enormous quantities of relatively unhealthy food. Step on the scale and I’m around 175.8. And I had told my wife yesterday that I would try to stay between 175 and 185, or maybe that was one of these totally internalized conversations; hard to tell presently. But I’m concerned. I’ve not been placed in a situation where I’m supposed to gain weight. Thing is, I look pretty good at 175. A lot more definition in my legs, for example, without losing shape anywhere else. But still, how to slow or stop the weight loss? I dig into my very neglected cheese drawer, skim past the three unused chunks of parmesan cheese, past the cheddars, past the Dubliner. There it is, a nice chunk of Kerry Gold Ivernia, and I cut off a slice, estimate it to be 2 ounces. Then I weigh it on the scale. 0.55 ounces. So I shave more off, until I have a whole 1.3 ounces of good rich cheese. The bite has salty overtones I had forgotten, the rich cheesy aftertaste lingers. Then its back to Fiber One, milk, flax seed oil and the low fat Baby Bels for the rest of breakfast. Web MD says I have to eat 2800 calories a day, if I’m exercising lightly, to gain 1 pound a week. I can do it easily, but can I do it safely? Saturated fat is ‘teh ev1l’ to my doctor. My maximum carb intake is fixed. Proteins above a certain point (along with calorie richness) lead to gout issues. Left behind are monounsaturated fats: oils and nuts. Thing is, I can demolish a can of cashews in an hour, much less a day. Got up, weighed myself. 177.5 pounds. Instead of the diet being virtually over, it is over. Maintenance from now on. I haven’t been posting much because I had surgery for a hernia last Friday. It was relatively pain free within a couple days, though coughing and laughing still hurt, a lot. Now I’m in, as Mike Stock of 285 Foodies puts it, in a “livit” from now on. I lost most of my weight using Cheerios as my mail morning cereal. I’ll note that I was lucky in this regard, as many diabetics can’t handle the sugars in the combination of cereal and milk. 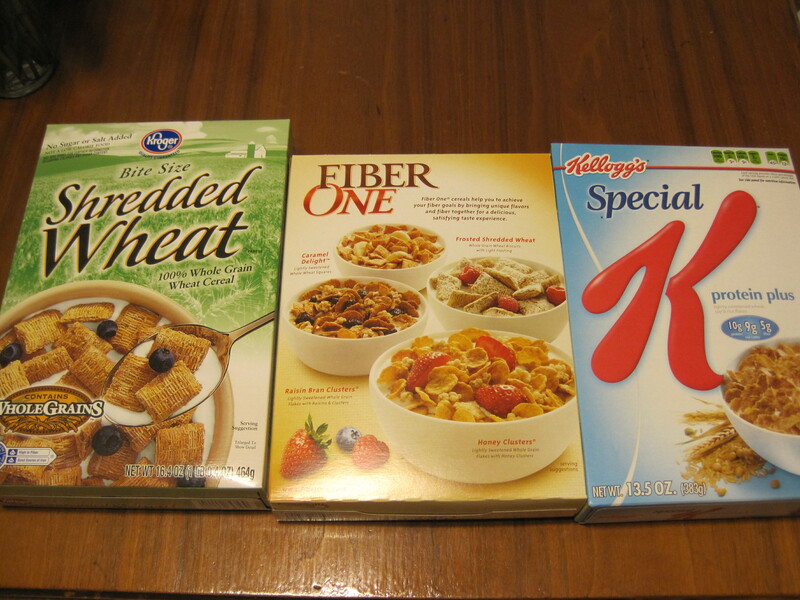 I’ve found three more cereals I can use in the mornings, two oldies and one that’s new to me. The new one is Fiber One, which has 25g of carbs per serving, 14g of that dietary fiber (and therefore, depending on the rule used, can be subtracted from the total carbs of the day, or half the fiber can be subtracted). The second is a version of Special K called Protein Plus, which has only 2g of sugars. The third is any of the kinds of Shredded Wheat, which can be used if you will cut the serving size in half. Sugars in the Shredded Wheat category are exceptionally low, but the standard serving has well over 40 grams of carbs. Half the serving falls into a tolerable range, with milk.